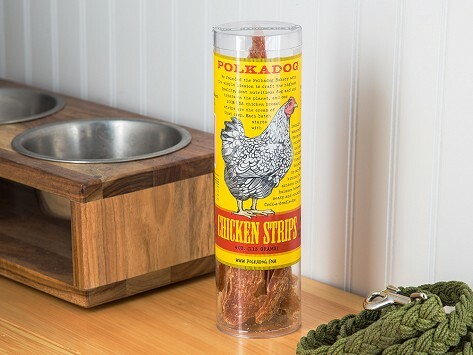 Locally sourced, farm-raised chicken is used in Polkadogs Bakery’s Chicken Strip Jerky treats. 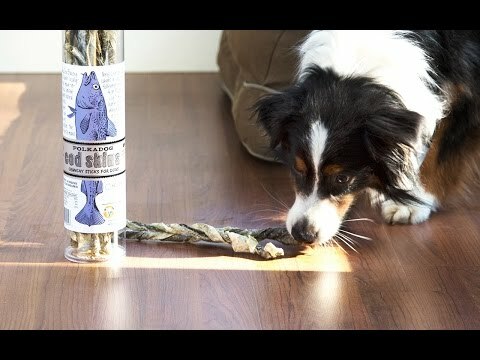 These single ingredient treats are made from hand-stripped chicken breasts that are slowly dehydrated to give your pup a chewy, crunchy, meaty snack. Package Dimensions: 10" x 2" x 2"
The dogs vote these treats as #1! Some of us enjoy spoiling our pets more than ourselves. Boston-based Polkadog Bakery lets you indulge your favorite pup with top quality, natural dog treats. Polkadog began when Deb Suchman and Robert Van Sickle wanted to give Pearl, their new rescued pooch, the care she deserved. Her life before as a malnourished stray with impaired vision led her to do a bobbing dance. They called her the little Polka Dog. Pearl’s parents hand made her gourmet snacks from single ingredients like cod and chicken. The treats were a hit with Pearl, and Deb and Robert found a new calling. Polkadog starts with the highest quality proteins, sourced from local suppliers around New England and the rest of the U.S. Then they put love into each piece, hand rolling the cod skins and hand stripping chicken breasts then slowly dehydrating them to crunchy, chewy goodness that will make your hound happy.